The Thundridge Neighbourhood Plan has been prepared to guide the growth of Thundridge Parish from 2018 to 2033. Thundridge Parish Council have received correspondence from the Diocese of St. Albans referring to the possibility that Thundridge Old Church may be sold for 'sensitive residential conversion'. The Parish Council have replied to the Diocese strongly opposing the idea on multiple grounds. The Parish Council is delighted to report the following from David Wilson Homes - Update: works to the footpath that exits the site on to North Drive is booked to commence on the 17th January 2019 and should take a couple of days to complete. 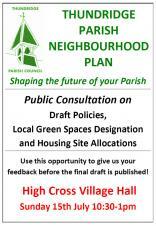 The Thundridge Neighbourhood Plan started it's latest consultation process with a public meeting at High Cross Village Hall on Sunday 15/07/2018. Thundridge Neighbourhood Plan Meeting covering Thundridge Parish. PLEASE attend and comment on the proposed policies, Local Green Spaces and Housing Site Allocations. This is a public consultation and your input will be greatly appreciated! 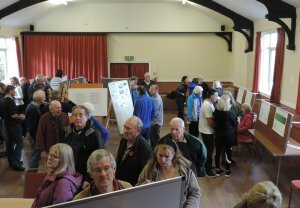 Thundridge Neighbourhood Plan public consultation took place on Saturday the 11th November, 2017 at Thundridge Village Hall. Over 90 Parishoners attended the event. Lots of Parishioners comments and feedback was captured and will be fed back into the Neighbourhood Plan over the next few weeks. Please find attached details of contact information related to the reporting of local crime including anti-social behaviour. There is an initiative by East Herts Community Safety Partnership in regards to an increase in reports of anti-social behaviour within and around High Cross. XHTML 1.0 validated. WCAG compliant. Page generated in 0.1341 seconds.